stands in front of Northwest Airlines flight attendant uniforms. 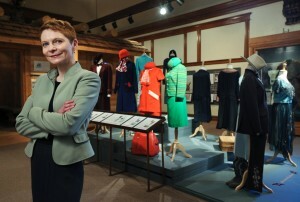 An exhibit at the Western Heritage Center, Billings, MT, celebrates a wide variety of women's work roles. A collection of NWA flight attendant uniforms is on display, as well as clothing worn by local women, including a buckskin suit owned by Calamity Jane! The exhibit will continue through mid-September, 2012. Check out "A Mile in Her Shoes: Montana Women at Work."